I was into this movie from the get-go since both Cary Grant and Audrey Hepburn are in it. In my book, this movie has it all. It’s a suspenseful thriller, a romance, and it’s surprisingly funny. Plus it has those amazing opening credits and the music of Henry Mancini. It’s a somewhat silly story, as those quintessential 60s crime capers are wont to be. Audrey Hepburn’s husband dies and it turns out he was a thief and three crooks think she has the loot so Cary Grant (whose name changes every 5 minutes) comes to her aid. Of course they fall in love. Obviously. Grant and Hepburn are so smurfing adorable together that the 25-year age difference doesn’t even bother me (unlike the 30-year age difference between Bogart and Hepburn in Sabrina). 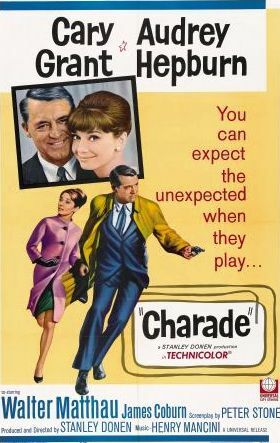 Charade is full of amusing exchanges like, “When you come on, you come on, don’t you?” To which Hepburn replies, “Oh, come on!” And Grant’s delightful with lines like, “How about making me vice president in charge of cheering you up?” Oh, Cary, just seeing you doing your “Drip dry, drip dry” bit is cheering me up. This is just the kind of movie necessary on a desert island because it’s so ridiculously enjoyable and funny. Besides, I’ll need something to distract myself from my inevitable demise since my experience will most likely not mirror Swiss Family Robinson in any way.